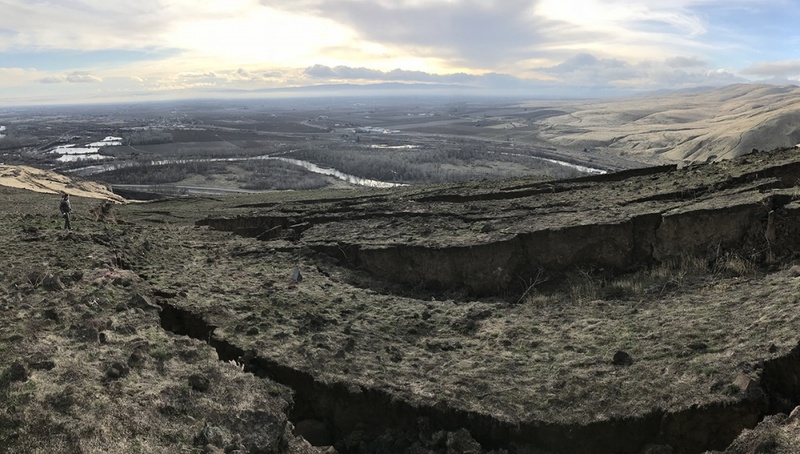 UO scientists have established a presence on a portion of Washington’s Rattlesnake Ridge that is expected to collapse into a major landslide southeast of Yakima and Union Gap. A video shot in mid-January by Tyler Newton, a doctoral student in the University of Oregon's Department of Earth Sciences, atop Rattlesnake Ridge, near Yakima, Washington, shows deep cracks in the top layer of basalt that is expected to collapse in a landslide. The video initially looks to the southwest, with Interstate 82 and the Yakima River visible below, and then scans northwest, providing a view of the fractured hillside and Union Gap and Yakima in the background. 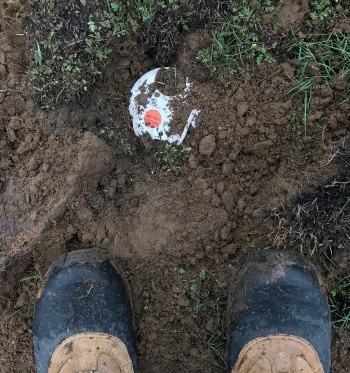 In mid-January, Amanda Thomas, a seismologist and assistant professor in the Department of Earth Sciences, led a small contingent around the hillside, placing 38 small seismometers that will allow her group to analyze data about ground movements to potentially help in emergency preparedness. Data collected, Thomas said, also could eventually be useful in monitoring future landslides and forecasting when collapses will occur. Meanwhile, Doug Toomey, also a seismologist and a professor in the department, has placed a camera at a quarry owned by Columbia Asphalt and Gravel below the 1,800-foot hillside’s south side, which is predicted to be ground zero for a 250-foot layer of basalt when it collapses. A second camera will soon be added. Three-foot deep cracks were spotted in October on the hillside, located on the eastern side of Rattlesnake Ridge and just to the east of Interstate 82 and the Yakima River. Since then, the deepest cracks have grown to 250 feet and the slide has accelerated from a foot per week to 1.6 feet per week. The slide could release some 3 million cubic meters of rocky materials. Rattlesnake Ridge was formed by layers of basalt — lava that has cooled to form igneous rock – deposited amid increments of volcanic activity between 17 million and 12 million years ago. Between each layer is weathered sediment that gathered between volcanic eruptions in the Columbia River Basin. The coming landslide, Thomas said, involves the top layer of basalt. The hill is above the region’s water table, and the basalt quickly repels rainfall, making for a landslide area unlike the sudden 2014 landslide of rain-saturated soil near Oso, Washington, Thomas said. Data from the seismometers will be analyzed by Thomas’ earthquake seismology group and shared with colleagues with the Pacific Northwest Seismic Network, which earlier had placed three seismic monitors near the landslide. The placement of the UO equipment – some in arrays with multiple seismometers – will help researchers separate seismic signals from small earthquakes below the slide and those from other sources such as highway traffic and aircraft. With improved station coverage, Thomas said, her team could determine whether the coming landslide may veer to the west, which would endanger Interstate 82 and the Yakima River. Should the river be dammed by the landslide, flooding could threaten Union Gap and Yakima. The seismic activity being monitored comes from the easternmost stretch of faults associated with the Cascadia, Juan De Fuca and North American plates. Rattlesnake Ridge, located on the Yakama Nation, is part of a region that is being slowly being squeezed clockwise at a rate of 1 degree per million years, Thomas said. Accompanied by a representative of the Yakama Nation, Thomas, her doctoral student Tyler Newton and Sara Meyer, a field tech with the Pacific Northwest Seismic Network based in Toomey’s lab, installed the seismometers. The work required permission from the Yakama Nation, Washington Department of Natural Resources and Columbia Asphalt and Gravel. Data coming in from other sources, including GPS readings, laser-surveying stations and ground-based radar and laser scanning, are being fed to the some 50 local and state agencies monitoring the ridge. Officials had been forecasting mid-March to May as the likely time for the collapse, but they have since pulled back from that timing and are no longer projecting when a landslide will occur. Toomey’s cameras are feeding data at a frame per second to the University of Nevada, Reno, Seismological Laboratory as part of an expanding collaboration involving earthquake monitoring and wildfire-spotting efforts in California, Nevada and Oregon. Views from the site can be seen via Seismological Laboratory’s AlertOregon webpage. Once there, viewers can right-click (PC) or control-click (Mac) on the image to see time-lapse views of the landslide site.